Many of you are eager to play Siralim 3 on PlayStation 4 and Nintendo Switch, so I figured I’d write up a quick status update regarding where I’m at in the porting process for each of these platforms. Originally, I announced that Siralim 3 would be released for PS4 on March 29, 2019. While that’s still the target release date, please be aware that Sony hasn’t approved my metadata submission for the game yet. The game cannot be released until the metadata is approved, so it’s possible that I’ll be forced to push the release date back a few days, or even up to a few weeks. Unfortunately, this issue is out of my hands: I’ve done everything that I’m supposed to do on my end, so it’s all in Sony’s hands now. For those of you who are curious: “metadata” refers to information found on the PlayStation digital shop, such as the game’s description, screenshots, ESRB rating, and more. I’ll keep you updated as I find out more information and announce a new release date if necessary. Of course, everything might just work out and we’ll be able to move forward with our original March 29 release date as expected. I’ve had Siralim 3 up and running on my Switch development kit for several weeks now. However, I’m currently waiting for Nintendo to approve some “paperwork” before I can even submit Siralim 3 for certification. For that reason, there is still no way for me to predict a release date for the Switch release. I’ll post an update as soon as I get more information. Thank you for your patience! The game plays extremely well on the Switch and I can’t wait for you to try it out. We’re proud to announce the opening of our new merchandise shop: Thylacine Merch! The shop currently offers phone cases, posters, mugs, and a few miscellaneous extras for each of the three Siralim games. We plan to steadily add new items to the shop over time, so keep an eye out for new products! Thylacine Studios is hiring a graphics artist to draw UI elements for our upcoming game, The Negative. The Negative is a 2D pixel art RPG that has a dark environment similar to what you might find in Dark Souls or Bloodborne. Primary Task: Create reusable UI elements for the game, such as panels, buttons, checkboxes, radio buttons, sliders, gauges, etc. You will also be asked to draw non-reusable assets such as item icons and other miscellanies. Payment Method: Must accept PayPal. Payments will be made on a per-asset basis. Sorry, but we won’t pay by the hour, day, etc. Workflow: We’d like to find someone who will be available sporadically throughout the next year. Your workload won’t ever be particularly large (aside from the first few weeks), but we’d like someone who can fit a few additional assets into their schedule every week or so. We would like to build a long-term working relationship with you for this game, and possibly others in the future. All communication will be conducted via e-mail. Experience in UI design, and proof of this work in the form of portfolios, finished games, and anything else you can think of. Excellent communication skills: a good command of the English language, fast e-mail response times, etc. Ability to think creatively without too much hand-holding. Experience in playing games with a “dark and gritty” atmosphere, including Bloodborne, Dark Souls, Salt and Sanctuary, etc. Please include a relevant portfolio that includes any UI elements you created in the past. Please don’t make us dig through work that is irrelevant to our needs, such as concept art. Tell us a little about yourself: your past job experiences, where you’re from, whether or not you work full time on game design/art, your favorite types of games, and anything else you think is relevant to the task at hand. If you have any questions about our company or the task at hand, feel free to ask! Please note that due to the large volume of e-mails we typically receive for job postings, we may be unable to respond to all applicants. Thank you for your time! We look forward to working with you. 2018 has come to an end, and what a year it’s been! Let’s start by looking at everything that happened this year, and then discuss what’s coming in 2019. In May, Siralim 3 entered Early Access on Steam. Thanks to the excellent feedback provided by our community, we launched the full game on Windows, Mac, and Linux just five months later in October. And only one week after that, we released the game on Android and iOS as well. Siralim 3 is already the most successful game in the series by far. Not only has it earned the best reviews on all platforms (96% positive on Steam, and 4.9 stars on both the Google Play Store and Apple App Store), it is also on track to sell more copies than either of its predecessors. I’m very proud of how Siralim 3 turned out, and it has been a sincere pleasure to talk with other players about the game and collect feedback to make it even better. “More Is Better”, which added tons of new content to the game, including new Nether Bosses, a pseudo-gambling system (Shady Dealer), new items, new quests, new achievements, and so much more! 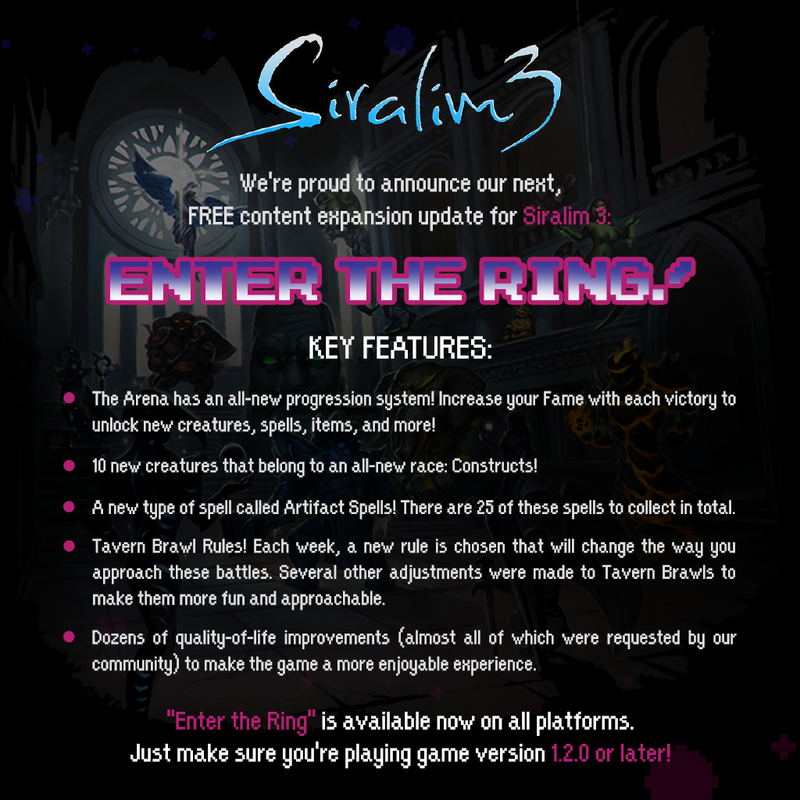 “Enter the Ring”, which added a progression system to the Arena, improved the Tavern Brawls system, and added new creatures and spells to the game. Oh, and let’s not forget the dozens of quality-of-life improvements that came with this patch as well! 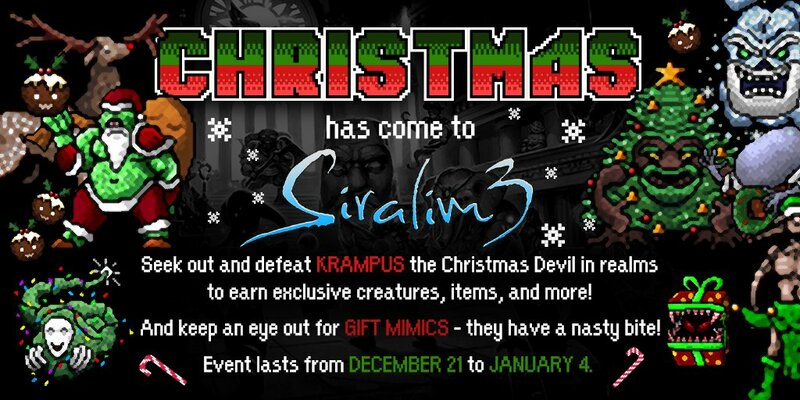 We also hosted two in-game, seasonal events for Siralim 3 for Halloween and Christmas. These events offered new challenges to players and rewarded them with exclusive creatures, items, and more. Siralim and Siralim 2 were physically released on PlayStation 4 and Vita! This year, console players were able to purchase both Siralim and Siralim 2 in physical form for PS4 and Vita. Only 4000 copies of each game were available, and they sold out within a day. Hopefully, you managed to snag the copies you wanted before they were gone! Community has never been so important. Ever since I started developing games, I dreamed about having a growing community of players that would stick around and play/discuss our games for years to come. Five years later, I think we’re finally having some success on that end. Our Discord server has up to 450 players on it at a time, and players have been interacting with each other on social media now more than ever before. My favorite part about our community is how welcoming we are toward new players. It has been a humbling experience to watch our playerbase expand over time, and I won’t ever take that for granted. In order to aid in the growth of our community, I decided to hire a new graphics artist who focuses solely on creating art for our social media, blog posts, website, and things like that. His name is Raleigh, and he is responsible for all the images we’ve been posting on social media this year. Holiday announcements, creature redemption codes, Creatures of the Week, and just about everything else you see on Facebook, Twitter, reddit, our forums, and our blog are all drawn by Raleigh. I’ve also been very lucky to work directly with a few Siralim players this year. Mario (Umaro) and Sergio are both Siralim players who wrote all the lore for the creatures in Siralim 3. They went above and beyond my expectations for this project, and the result is a breathtakingly deep volume of lore for players to read and enjoy. Another familiar name around the community is “gay monster dad”, who drew all the sprites for the creatures we gave away for Halloween and Christmas. Originally, I had no plans at all to have seasonal events in Siralim 3, but GMD’s ideas for holiday creatures were so endearing that I couldn’t help but ask him if we could add some of his work to the game. GMD also programmed an awesome bot for our Discord server that serves as a robotic wiki that allows you to ask it questions about the game! And, if that’s not enough, he also wrote a bunch of useful guides for Siralim 3 on Steam. “Unagio Lucio” is yet another player who has contributed some awesome new art to Siralim 3. Unagio has already re-designed the overworld sprites for Gargantuans and Spectres, and he’s working on even more as we speak. They’re clear upgrades to the original sprites, and they make for a better game. Lastly, several people contributed singular palettes to the game. These palettes are what give Singular Creatures their unique color scheme. In particular, DragOhNite and Umaro contributed the majority of these palettes (426 and 265, respectively), and without their help, Siralim 3 wouldn’t have Singular Creatures at all. And let’s not forget everyone who contributed to the wiki. Fairwyn came back again and created yet another wiki for the Siralim series, making this her third wiki contribution for Thylacine Studios’ games! I know a lot of people contribute to the wiki daily, so thanks to everyone who has added data to it this year! It’s one thing to find some random freelancer from reddit to work on these games, but it’s a whole other world to have the opportunity to work with the players themselves. These people genuinely care about the game, and I think it is very apparent that Siralim 3 is a gift of love from the community itself. If you see any of these players on the forums or Discord, please thank them! The game wouldn’t be half of what it is today without their help. Alright, enough about the past. Let’s get to the good stuff! 2019 is going to be our biggest year yet. It’s almost ridiculous. We still have two seasonal holidays that we plan to add to the game: one for Easter, and one for some sort of made-up summer festival. As you probably expect, these events will reward players with exclusive creatures and items. We’re going to make some improvements to the Halloween and Christmas events as well. Originally, I didn’t get to spend as much time on these events as I wanted, so I’m going to add some new things to them and make them more interesting. There are plenty of smaller events in store as well, and you’ll have the opportunity to unlock even more wardrobe costumes and titles in the coming months! Outside of that, I have plenty of quality-of-life improvements that I still want to add to the game. Siralim 3 is coming to consoles. We’re bringing Siralim 3 to PlayStation 4, Xbox One, and Nintendo Switch in 2019! I am very excited about the Xbox and Switch ports in particular, because this will be the first time I’ve ever released a game on either of these consoles. I don’t have an ETA for these releases yet, but I’ll announce a release date as soon as I can. You didn’t forget about The Negative, did you? For those who don’t know (or remember) what The Negative is: it’s our most ambitious game to date. 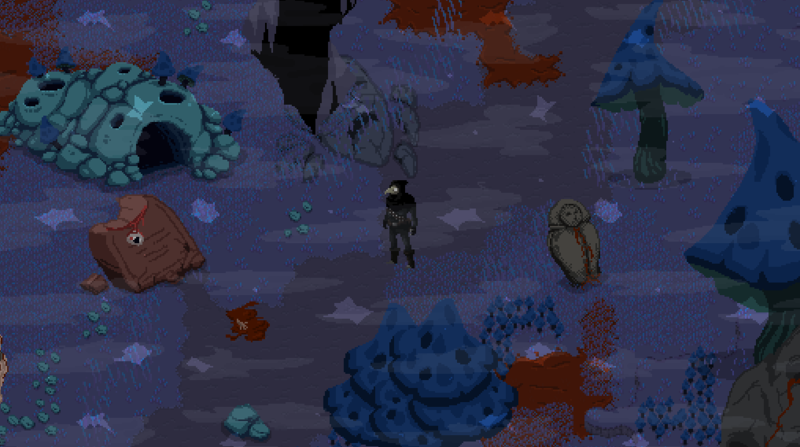 It’s a dark, evocative RPG that is all about capturing monsters. It’s going to be very different from the Siralim games, but it will still have the depth of gameplay and chunks of innovation that you’ve come to expect from us. My goal for 2019 is to have a demo version of The Negative ready for you to play. I’m hoping to have one full environment ready for you to experience. You’ll be able to walk around, fight enemies, complete a few quests, and see how the game plays. It’ll probably be more of a technical demo rather than a full gameplay demo, but I want to give you something to try as soon as I can. Alongside the release of the demo, I’m also going to launch a Kickstarter campaign for the game. Honestly, The Negative is going to be completed whether the Kickstarter is successful or not, but I’ll use these funds to make the game even better. For example, I really want to add voice acting to the game, so that will be the primary focus of the Kickstarter. The success of the Kickstarter will also determine how much post-launch content I can add to the game. Also… I’ve completely reworked the design of the game since I first announced it a couple years ago. If you followed along with my development blog posts for the game, you’ll have to forget everything I told you about The Negative. It’s going to be a much better game than I originally planned, and unlike any other game you’ve played before. I will start posting regularly on the blog at thylacinestudios.com again. Early in the year, I’ll write one general game development post per week. Later on, I’ll write even more posts to discuss the reworked version of The Negative along with some other surprises that I can’t talk about just yet. I’m working on some other things behind the scenes that aspiring game developers might find useful as well. Creature of the Week? That’s not going to be enough anymore. From the first day of January 2019 onward, I’ll post a Creature of the Day on our Facebook and Twitter every single day of the week. This all-new format includes more details about the creatures than ever before, including their lore, trait, and base stats. There are over 750 creatures in the game, so those should last us for quite a while! Raleigh is going to design some awesome new Siralim merchandise for us to sell. There will be new t-shirts, hoodies, coffee mugs, mousepads, posters, and much more. All of these products will feature hand-drawn art based on Siralim creatures and characters! And so, so, so much more. There’s plenty more in store for 2019, including at least one major thing that I’m dying to tell you about, but I can’t quite yet. I want you to know that we’re firing on all cylinders now, and you can expect new content and games to come out at a much faster pace with higher quality than ever before. JC Malapit, for his work on Siralim 3. JC is working on The Negative now, and you can see the fruits of his labor in the screenshot I posted earlier in this post. Josh Queen, for producing the amazing soundtrack for Siralim 3… with plenty more to come in the future. Tim Bongiovanni, for his work on The Negative’s soundtrack. I can’t wait to share some samples of his work with you! TouchArcade, because I still think they are one of the major reasons the Siralim name was able to become popular enough for the games to be successful. TA still support our games to this day, and we are grateful beyond words for their help. Jason Walsh, for being a great friend and fellow developer. Outside of releasing his own game (Monster Crown), he’s also going to play a really big role in some things that are happening in 2019 for us – but unfortunately, I can’t talk about any of it quite yet. All the content creators who create videos, write guides, and post fan art on our forums and Discord. Everyone who we’re lucky enough to interact with on our social media platforms, our forums, and our Discord server. I can’t even count the number of days I’ve felt burned out and frustrated, and then someone sends me a quick “thank you” message via e-mail to pick me up and make me want to crank out another 12 hours of work. And last, but absolutely not least, I want to thank you. If you’re reading this, you’re who drives Thylacine Studios to make more games. You’re the best. Happy New Year! We can’t wait to make 2019 our best year yet. Christmas has come to Siralim 3! Our second content update for Siralim 3 has arrived! “Enter the Ring” has been released! Two expansions in one month? Yep! This patch contains more changes than any other patch we’ve ever released. I hope you’ll enjoy it! You can find a full list of changes here. Siralim will be physically available on November 2 for PlayStation 4 and Vita! 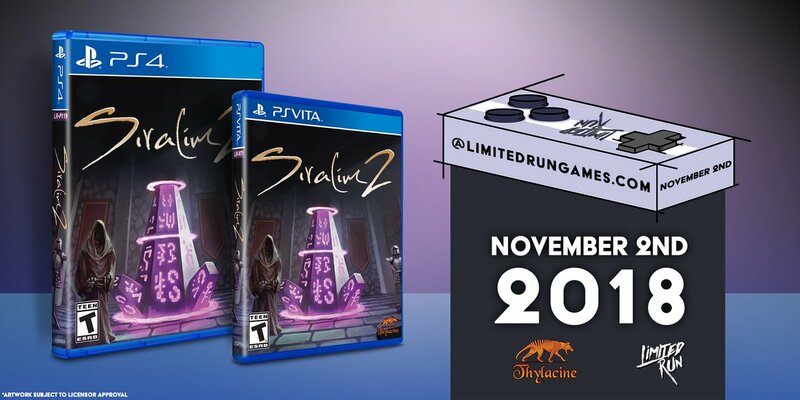 Siralim 2 will be available for purchase in physical form for PS4/Vita on November 2 at 10am ET! Last time we did this, Siralim 1 sold out in under an hour, so keep an eye on https://limitedrungames.com/! It’s almost time for Halloween, and we want to celebrate with you in Siralim 3! 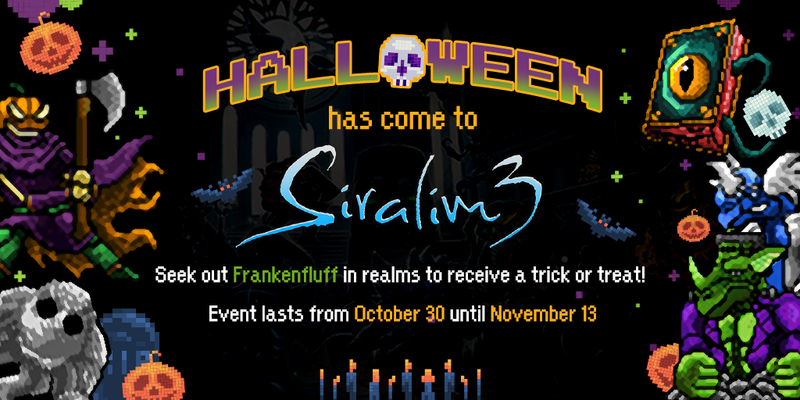 Search for Frankenfluff in realms to obtain 5 exclusive, Halloween-themed creatures! The most persistent trick-or-treaters will earn additional items from him as well. Go trick-or-treating at the gods’ altars to obtain some extra treasure! On October 31, you can play Siralim 3 to unlock a Halloween costume and matching title! Give Blanch the code “HALLOWEEN” to obtain a Singular Pumking egg! This code is available for you to use right now! Special thanks to community member “gay monster dad”, who created the Halloween skins and wrote the lore for this event’s creatures. Will Siralim 3, The Negative, and our future games be available on Nintendo Switch? Many of you heard the good news yesterday – GameMaker 2, the engine we use to develop our games, will support the Nintendo Switch later this year! This means that we can easily (well, not that easily) port our games to the Switch. With that in mind, many of you are wondering if our current and future projects will be available on this console. The answer is… hopefully. Nintendo is a lot stricter about which games and developers they allow on the Switch compared to other companies like Sony and Microsoft. The first step is for me to contact Nintendo directly and pitch my company and games. While I’m confident that this won’t be a problem, it is very possible that Nintendo will decline us. If we’re accepted, however, I’ll start working on it immediately. Keep in mind that very few developers are actually using GameMaker to create games for the Switch, so I’m guessing there will be a lot of issues on GameMaker’s side early on. This means that I’ll have to report a lot of bugs, wait for them to get fixed, and repeat this process until everything works. For that reason, it’s hard to predict how long a port to the Switch will take. But either way, I’ll do whatever is necessary to get it all working! I am still not sure if I’ll port Siralim and Siralim 2 to Switch. That would take a lot of work because not only would I need to port the game from GameMaker to GameMaker 2, I’d also have to port it to the Switch afterward. It might be a better use of my time if I focused on Siralim 3 and The Negative, then move on to new games. So for now, the answer is no. Someone also asked if our games will ever be available for 3DS. The answer is no. GameMaker doesn’t support 3DS and most definitely never will. Anyway, I’m very excited about this news and I look forward to the potential of getting our games on a Nintendo platform! Thanks to everyone who asked about the potential of a Switch port for Siralim 3 and The Negative. We announced our most ambitious game to date: The Negative! Look forward to this game in late 2018 or early 2019. We announced Siralim 3. You’ll be able to play it soon enough, and it’s going to blow you away. We released a new game as a side project: Learn Kana The Fun Way! We released Siralim 2 on PlayStation 4 and PlayStation Vita. We launched a free content update for Siralim called “Invasion”. We launched a free content update for Siralim 2 called “Renaissance”. We overhauled our website and started a blog to share more details about our games, as well as general game development. We launched a merchandise shop. We expanded our team to bring you even more games at a much faster pace than ever before. Siralim 3 will be released on all platforms. The Negative will (hopefully) enter Early Access testing. Another RPG is in the pipeline that should be out in mid- to late-2018. We will support additional platforms with our games. Specifically, we hope to support Xbox One. It’s too soon to talk about Nintendo Switch, but we are trying very hard to make it happen. And by “trying”, I mean that I’m sitting around and hoping GameMaker supports it soon. Siralim and Siralim 2 will be released on physical media for PlayStation 4 and PlayStation Vita. I want to thank Maarten Boot for his dedicated work on The Negative’s graphics. His passion fuels what promises to be one of the most satisfying games we’ve ever made. I want to thank Tim Bongiovanni for creating some of the most evocative video game music I’ve ever heard. I can’t wait to share some of the work he’s done. This also marks the 4th year I’ve been working with Tim. I want to thank JC Malapit for doing such an amazing job on graphics for The Negative (battle effects), Siralim 3, and Learn Kana The Fun Way. This is now the 4th year I’ve been working with JC. I want to thank Joshua Queen for creating such nostalgic, high-energy music and sound effects for Siralim 3 and Learn Kana The Fun Way. I want to thank Janette Ramos for the amazing, hand-painted app icons, title screens, and marketing media she’s created for Siralim 2, Siralim 3, and The Negative. I want to thank Mario (Umaro) and Sergio for their timely and professional work on writing Siralim 3’s creature lore. I want to thank Doug, Josh, and everyone else at Limited Run Games for making it possible even for small developers like us to publish our games on physical media. I want to thank all the content creators out there who published reviews and videos to showcase our games. I want to thank all the people on our forums, Discord, and social media for helping us to maintain an active community. I’d also like to thank many of those same people for their color palette contributions for Siralim 3’s Singular Creatures. And finally, and absolutely most importantly, I want to thank you for being the best customer and player anyone could ever ask for. Your passionate feedback and the excitement you show toward our games is the primary reason I’m still able to write this retrospective 4 years later. I promise to make each year better than the last, and I can’t wait to show you what we’ve come up with for Siralim 3, The Negative and our other unannounced projects very soon. I hope you have a safe and happy New Year!